Owning a home, for many people, is their life dream and a huge milestone in one’s life. However, it also comes with the hassle of dealing with regular home maintenance. A leaking pipe, a blocked drainage, improper functioning water heaters, blocked septic, and lots more – All these are some of the plumbing issues that can make life unbearable for residents of an apartment. As a result of this, it is very important to maintain a well-functioning plumbing system in your home. It is also important to have a steady flow of safe and clean water all through the home since water is essential to carry out daily household activities and tasks. 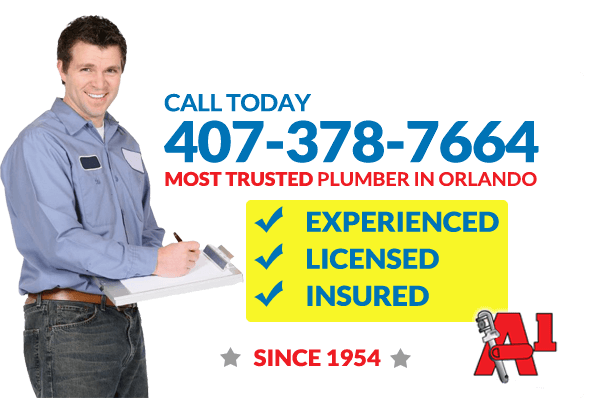 If you are looking for a reliable, and expert plumbing company to take care of all your plumbing issues, be it residential or commercial, A-1 Plumbing Service is the ideal company to get it fixed. No matter how large or small the job is our plumbing services in Longwood, Florida will provide the perfect and professional care for you. A1 Plumbing has been the premier Longwood plumber for over 50 years. We are here to solve your problems as fast as possible, and with a smile on our face! We are aware of the fact that waking up and being greeted with a blocked drainage, or clogged septic can be very awful. This is not a good way to get the day started. Even if you require Emergency Plumbing in Longwood, or you will like to hire the services of an expert plumbing company that offers 24 Hour Longwood Plumbing, A-1 Plumbing Service is always ready to get it fixed. Other services include emergency plumbing in Longwood and the surrounding areas. Our 24-hour emergency plumbing in Longwood will make certain that your plumbing issues get fixed immediately, and your plans are not compromised. As the premier Longwood plumber, we will do what it takes to ensure that you receive the quality, custom-tailored service that will surpass your expectations. Are you having plumbing issues, and you need it fixed as soon as possible? All you need to do is notify us at A-1 Plumbing Service. We have a team of expert plumbers that are always on standby to ensure that all your plumbing issues are fixed. Be it a clogged drainage system, broken toilet, busted pipe, damaged faucet, or your water heater, septic systems showers, and tubs, suddenly develop problems, our 24 hour Longwood Plumbing services will ensure that everything gets fixed as soon as possible. We are always working round the clock to ensure that you live a comfortable life. For over 50 years, we have been serving Longwood, Florida, and surrounding environs. We have the right team, experience, tools, and expertise to get your plumbing systems back to its proper state. Our services are very affordable. You can be guaranteed that no matter what, your home is in safe hands. Give us a call today for your 24 Hour Longwood Plumbing, we will always be ready to provide solutions straight away.